The National Land Trust Accreditation Committee announced in August, 2017, that GSWA has been formally designated as an accredited land trust, joining an elite group of only eight land trusts in New Jersey, and part of a network of 389 nationally recognized organizations. 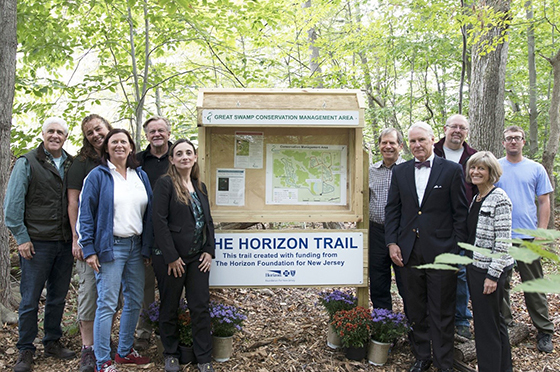 This is the culmination of years of work to protect, preserve and promote New Jersey’s open spaces, and this prestigious accreditation will serve as a key anchor for us as we look to provide stronger and broader involvement in land conservation. Over recent years we have developed and implemented a series of initiatives to serve New Jersey as the premiere land conservation and advocate in the Passaic River region, providing environmental education to community groups, teachers, and students, serving as a needed advocate and defender of New Jersey’s precious natural resources, and promoting an understanding of the importance of protecting our drinking water and preserving the natural beauty of our environment. In addition to the National Land Trust accreditation, last year we expanded our mission to advocate on behalf of the entire Passaic River and became the formal river affiliate to the nationally based Waterkeeper Alliance. It was through a series of land acquisitions over the course of many years that led to GSWA’s ownership of 73 acres of undeveloped land. This was the catalyst to applying for the National Land Trust designation. This plot of land, known as the Conservation Management Area (CMA) is fully protected and stewarded by our organization. The Land Trust Accreditation Commission is an independent program of the Land Trust Alliance, a national land conservation organization working to save the places people need and love by strengthening land conservation across America. The process by which an organization achieves this accreditation is a rigorous one. Applicants are required to provide extensive documentation and undergo a comprehensive review, providing proof of sound finances, ethical conduct, responsible governance and lasting stewardship of the lands they protect. Once achieved, accreditation ensures permanence in the conservation of open lands. Beginning in 1996, we gradually acquired 73 acres of property in Harding Township. Managed as a single unit we call the Conservation Management Area (CMA), the site contains critical wetlands, freshwater marsh, vernal pools, forested areas, and the Silver Brook (a tributary to the Great Brook and Passaic River), and is home to several state and federally designated threatened species, including wood turtle and barred owl. The property is traversed by a network of trails, with more than three miles of boardwalk and mulched paths winding through the forest and marsh habitat, and the trail system is still expanding! Trails are (View/download CMA trail map here) open to the public, and we encourage community groups and schools to use it as an environmental teaching tool. Dogs on leash are permitted. The long term stewardship goal for the CMA is to restore the property to a diverse and ecologically functioning floodplain forest. Our stewardship focuses on ecological restoration and enhancements of existing habitats, and to date has included extensive control of invasive plant species, enhancement of vernal pool habitat used by breeding amphibians, stream bank stabilization and replenishment, and improvement of habitat lost as a result of degradation by invasive species and deer browsing. Almost 30 acres of the property are fenced against deer browse, allowing for the forest understory to regenerate, aided by our extensive native plantings. Our secondary management objective is to optimize the site as a location for environmental education. We hope that schools, community groups, and individuals will all take advantage of our interpretive signs and information. 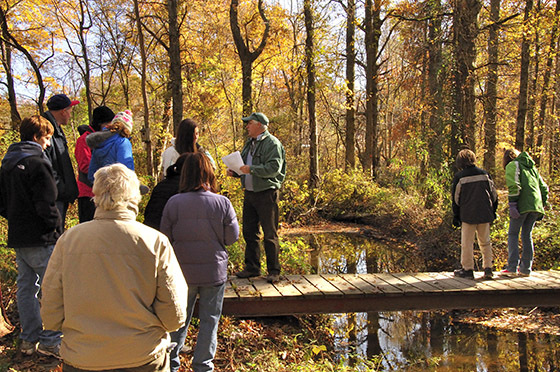 You’re invited to explore our Conservation Management Area (CMA) a wooded 73-acre natural area in Harding Township. Its miles of boardwalk and mulched trails are open to the public for walking, hiking, and nature study. GSWA has many scheduled events at the CMA throughout the year, including family hikes, natural history explorations, dog walks, and moonlight walks to name a few, but you can enjoy the CMA anytime at your own at your convenience. The CMA has two trailheads on Tiger Lily Lane, the Horizon Trail, which is located approximately halfway down the road, and the main trail head, which is located at the end of the cul-de-sac. Wear appropriate footwear, as trails can be wet, muddy, and slippery. Stay on the trails for your safety. Dogs on leash are welcome. Trails are open from dawn to dusk, except as noted during hunting season. 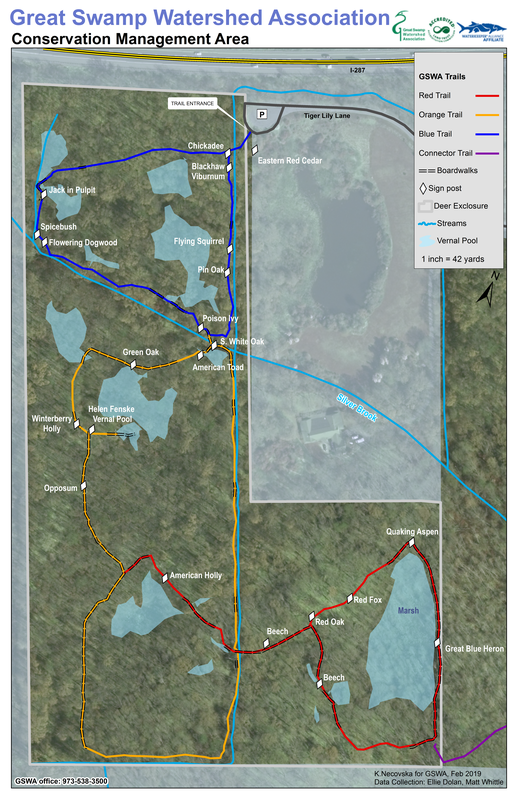 View/download CMA trail map here. Coming via I-287 North. Get off at exit 33 (Harter Road). At end of exit ramp, turn right on Tiger Lily Lane. Coming via I-287 South. Get off at exit 33 (Harter Road). At end of exit ramp, turn right over highway, turn right at Lutheran church onto Tiger Lily Lane.From Morristown. Take South Street to light at James Street. Proceed west on James Street 3.5 miles to traffic light at Harter Road. Turn right, then left at Lutheran Church onto Tiger Lily Lane. 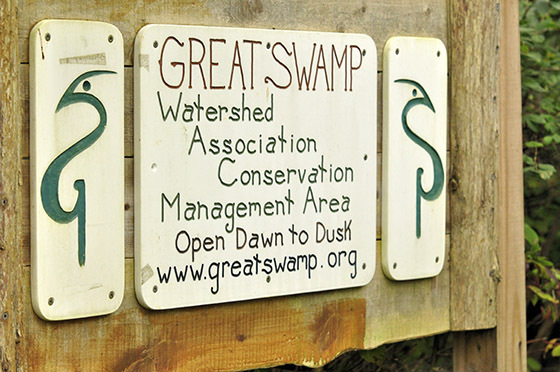 If you would like to visit the CMA with a group and receive a natural history tour or program, please contact Hazel England, Director of Education and Outreach and Land Steward at hazele@greatswamp.org. Deer management for herd reduction through hunting is allowed on the property. Each year from mid-September to late November, trails are open but there may be bow hunting, so proceed with caution. Late November to mid-February is shotgun season, and the trails are closed Monday-Friday, from 9 a.m. to noon. Trails are typically closed for the entire first week of December for firearms season. See updated information for annual dates (hunting info). 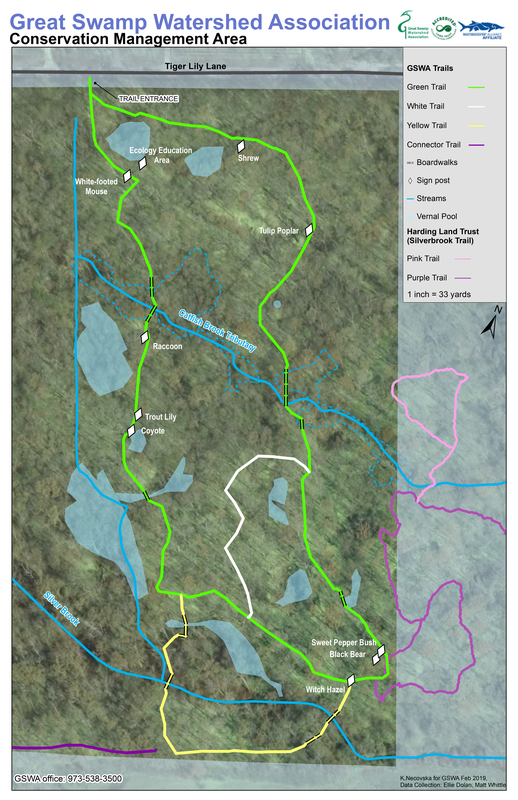 The two maps that follow depict the two trail entrances at our Conservation Management Area. First map depicts the trail system at the cul-de-sac end of Tiger Lily Lane. The second trial map depicts the entrance to the Horizon trail found mid-way down Tiger Lily Lane. Both areas are connected via the Purple Trail. The CMA is home to many exceptional plant and animal species, including several state and federally designated threatened species like the barred owl and swamp pink. You can view a list of plant and animal sightings at the CMA here. Want to know what you might see during a visit to the CMA? Use our month by month guide, created by volunteer and naturalist Blaine Rothauser. Have a sighting to report? Email Val Thorpe, vthorpe@greatswamp.org, to have it added to our list.